The Running Back Adversary Mode for GTA Online has returns this week along with the ability to unlock the Santo Capra Coins Livery for the HVY Menacer & Pegassi Oppressor Mk II. Rockstar has brought back the Running Back Adversary Mode and while the main goal of reaching the end zone is still the same, there are a few differences. Calling it a “remix”, this time out the “pocket-sized hatchback Runner” is both flanked and opposed by an upgraded fleet of Tezeracts. There are seven new Running Back tracks to try, and players who dare to face the gridiron will score Double GTA$ & RP now through October 1. Players who log into the game between now and September 24 will also unlock the Santo Capra Coins Livery for the HVY Menacer & Pegassi Oppressor Mk II. Pretty swish. This week Nightclub owners will also receive a 2X Boost on Nightclub Popularity gained from players dancing at their venue. 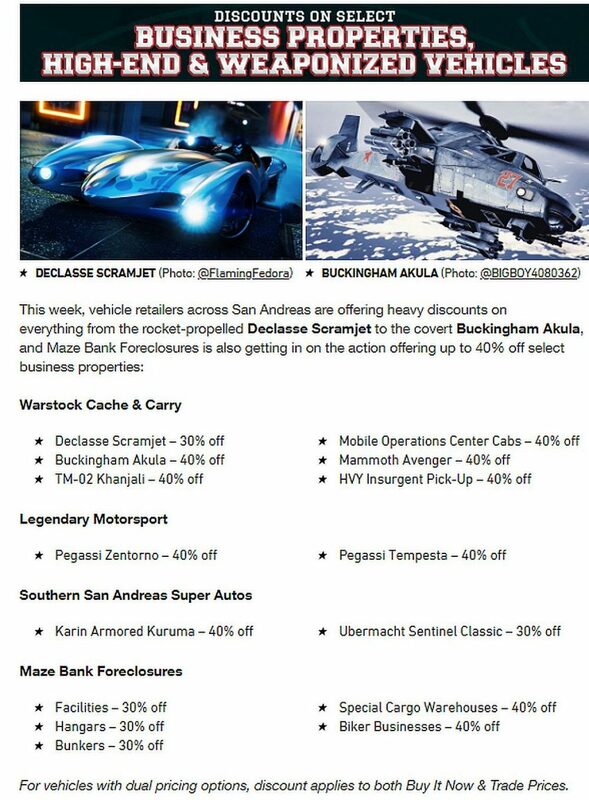 Vehicle discounts this week include greenbacks off the rocket-propelled Declasse Scramjet and the Buckingham Akula. Players can also take 40% off select business properties.